Iris Agate - A rainbow of color in a stone! Iris agate is a finely-banded agate that can produce a rainbow of color from a diffraction grating effect. Figure 1: Two views of a specimen of iris agate. The photo on the left was taken in normal light and displays the color of light reflected from the agate. The photo on the right shows the agate with backlighting. 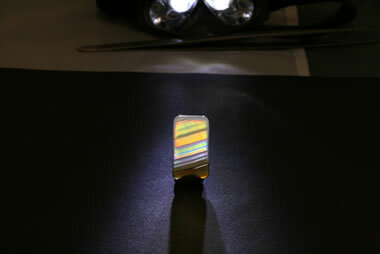 The backlighting reveals the diffraction grating or "iris" effect produced when light passes through the very fine banding of the agate. This specimen is a thin slice of Brazilian agate that measures about 25 mm high, 14 mm wide and 3 mm in thickness. "Iris Agate" is a name used for a finely-banded agate that produces a spectacular display of color when it is cut properly and illuminated from a direction that sends light through its very thin bands. The name "iris agate" is used because one meaning of the word "iris" is "a rainbow-like display of colors." A specimen of iris agate is shown in the pair of photographs in Figure 1. This specimen is a thin slice of agate that measures about 25 mm high, 14 mm wide and 3 mm in thickness. The agate is very finely banded. The parts of the agate that produce the iris effect are translucent to transparent and have at least 15 to 30 bands per millimeter that are countable under a gemological microscope. Some parts of the agate have a higher density of bands, but they cannot be counted because they are very thin and the agate is milky. Rainbow agate: An enlarged view of the iris agate specimen with backlighting. This view is at a slightly different angle than the backlit view above. It demonstrates that the spectral colors change with the angle of incident light and observation. The photo on the left side of Figure 1 shows the iris agate specimen under normal illumination. The colors that you see in this photo are mainly colors of light reflected from the surface of the agate. The photo on the right side of Figure 1 shows the same specimen; however, in this photo the source of light is behind the specimen. The colors that you see in this photo are produced by light that is transmitted through the agate. These colors are very different from the reflected light view and very different from the body color of the agate. They are produced by an optical phenomenon known as diffraction. When light strikes the agate, it encounters the edges of the tiny bands. These bands disrupt the flow of light, and the rays of light take many separate paths through the thin bands of the agate. The bands act as a natural diffraction grating that diffracts the light and produces a display of spectral colors. Observing iris agate: To observe or photograph iris agate, the stone must be between the observer's eye and a strong light source. The illumination must come from behind the stone. For this reason, iris agate is not a good material for many jewelry uses. It would not work in a ring or a pin. Very thin slices of agate could be used as dangle earrings; however, they would only exhibit the iris effect when the observer is looking at the earrings and the person wearing them is between the observer and a strong light source. Most agates will not produce an iris effect. Candidates are those that are very finely banded and nearly transparent. They must be sliced so that the sawn surface is perpendicular to the banding of the agate. The thinner they are sliced, the stronger the spectral colors. (Our slice, at 3 millimeters, is thicker than optimal and shows higher order colors instead of primary colors.) The surface of the agate should be brightly polished to allow the easy entry of light without the scattering caused by an unpolished surface. To observe the iris effect, the agate must be positioned between the observer and a light source with the rays of light striking the surface of the agate perpendicular to the polished surface. At that angle a maximum amount of light will enter the agate. Iris agates can be placed on a display stand or dangled on a string in front of a sunny window. They can be mounted in a display case with backlighting. Some people display iris agate in jewelry. The requirement for backlighting prohibits a good spectral display in a ring, pin or brooch. The stone must be suspended to have a light source and observer on opposite sides of the stone. The best jewelry use is in earrings. 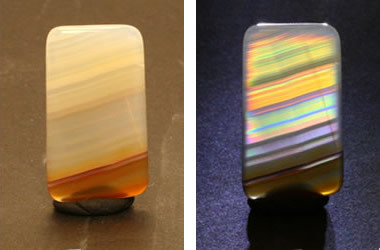 Iris agate cabochon: The two photos above show an iris agate cabochon in transmitted (top) and reflected (bottom) light. In reflected light it looks like a plain white agate with a few cloudy but translucent bands. However, in transmitted light it has a nice display of "iris color" traversing its length. This specimen is approximately 23 mm x 13 mm x 5 mm in size and was made from agate found in Indonesia. Specimens of iris agate are not often seen in museums and mineral shows. However, they are probably much more common than most people realize. Most agate slabs are cut too thick to produce a strong iris effect (the thinner the slab, the stronger the colors), and many thinly-sliced agates are not observed in a way that reveals the iris effect. So, if you have some thinly-banded agate that is translucent to transparent, you could cut a thin slice to see if there is a rainbow inside. 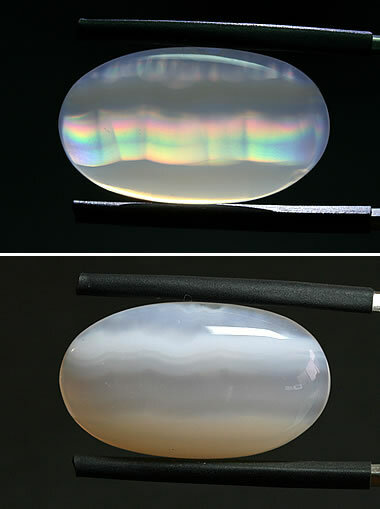 Cat's eye scapolite: The stone on the left is a 10 x 7 millimeter oval with a very coarse silk. The silk can be seen in the stone as linear bands of black inclusions that cross the stone from left to right. The cat's-eye forms at right angles to the silk. The stone on the right is a 12 x 9 millimeter oval with a coarse silk. The silk has just the right spacing to serve as a diffraction grating and produce a beautiful display of iridescent color. Iris effect cabochons could be used as ring stones but the iris effect would only be observed when the stone is between the observer and a strong source of light that enters the stone at a low angle. 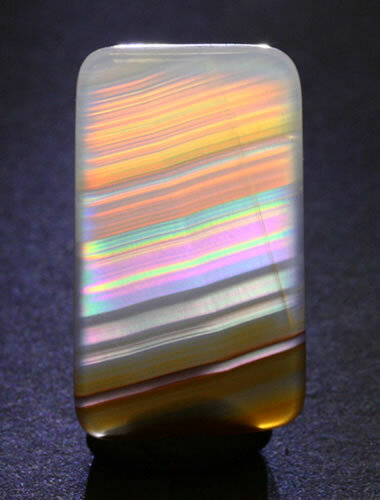 Next time you find a cabochon with coarse silk suspended in clear material, hit it with a beam of low-angle light. Sometimes cabochons with a coarse silk can produce an iris effect under proper illumination. The scapolite on the right side of the photo has a very coarse silk of included minerals with a very clear material between the silk fibers. The cabochon produces a cat's-eye under high-angle illumination. When the stone is between the observer and a source of low-angle illumination, rays of light enter the stone and are diffracted by the coarse silk to produce a bright display of spectral colors.